Fashion illustrations are studies of designer’s ideas before the actual production of clothes. Fashion illustration entails drawings, paintings, and digital drawings of clothed figures. In the world of fashion, fashion illustrations reduce the amount of waste produced tremendously. It helps the designer study form, function, fit and feel in advance of construction. Before photography, magazines, patterns, and books featured watercolor paintings and sketches of costumes. Vogue magazine featured fashion illustrations on their cover page. The first illustration for the cover of Vogue was published on April 1, 1947, and was done by Dagmar Freuchen Gale. The vignettes, or quick drawings, convey ideas and inspirations. Fashion illustration is an art that offers a career. It is also becoming a fun activity in events like weddings and promotional events in which a fashion illustrator is hired to do quick illustrations of the attendees. There are many different styles of fashion illustration. They all start with the study and practice of the basics of drawing the human body. NEXT.cc’s Line and Sketching Journeys will get you loosened up and ready to sketch people! Although the body and face may seem hard to get right, everything divided into eight proportions. For example, the first eighth is the face divided into three parts. Once you have the head as an eighth, draw a light vertical line through its center and divide the vertical line into eight sections. Next block out the hips above the half way or 4/8 point. Feet are at the bottom, opposite of the head. Draw the shoulders in the middle of the second eighth with the chest dropping down halfway into the third division. Kneecaps are above line six, with calves below and thighs above. Hanging arms drop from the shoulders (which are approximate twice the width of the head with the elbow in the third division, wrist at the 4th, and hand with fingers taking up the fifth division. Practice drawing a neutral stance from both the front and the side. Review the eight proportions. While drawing a human body may seem intimidating, each body part is proportionate to the others. Follow this image and practice drawing a neutral stance from both the front and the side. Note the proportions from one body part to the next. Illustrators like to draw every view of the model as well as show a variety of expressions. People are all different in their look, their stance, and their glance! 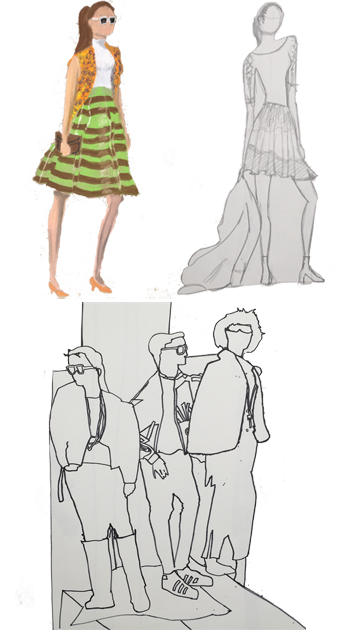 While many people vary in shape and size, the fashion illustrator works to enhance all types of figures and faces. Practice figure drawing by having someone model for you and doing some quick sketches. Keep in mind the eight parts of the human body and experiment with different poses. Light and shadow are essential in fashion illustration as they capture the angle of the model is standing and add depth, texture, form, a suggestion of movement, and a bit of sparkle. Illustrators position light coming from one direction (usually from above to mirror natural light). However, sometimes the lighting is intentionally from the side or from below shining up; how does this change the mood of the image? The direction of light produces differences in value casting varying shades of shadow; take a look at [NEXT.cc’s Shade Journey](. The different values suggest depth and turns a two-dimensional shape into a realistic form. Folds in skirts, pleats in a dress, the fall of the sleeves, and a cut of a bodice all build three-dimensionally on the flat page. Illustrators become experts at using light and shadow to bring life into their drawings. Have someone model for you, wearing a variety of clothing and accessories with a lamp pointing toward them. Capture the highlights and the shadows on the model’s figure and accessories. Using different mediums such as graphite, watercolor, pastel, and markers, illustrators produce effects of various materials capturing the excitement and essence of the design. Pencil or graphite reveals subtle values in clothing and accessories on models; there is an unstated elegance to gray tone renderings, which concentrate on form and texture evenly. Watercolor softens or abstracts the illustration. Illustrators work to reveal the material qualities as well as capture the style and type of clothing. The selection of media to match the fashion is important as it communicates different emotional tones and moods. Selection of media to match the fashion is important as it communicates different emotional tones and moods. Look at examples from famous illustrators. See which media renders fashions formal, informal, subdued, business-like, fancy, frivolous! Draw one fashion in three different media and note which one suits the design the best. Fashion illustration started as costume plates. Originally hand drawn as designs to be worn for plays and operas or by luxury robes and frocks of kings and queens and cataloged in libraries of the wealthy, drawings of the clothes we wear now and would like to wear have been disseminated in books, magazines, newspapers, posters, and now on our computers. Fashion illustration as an art form appeared with the invention of the Gutenberg printing press in Munich, Germany in 1465 and developed in the late 1800s and early 1900s with accurate and detailed renderings of designs appearing on magazine covers and posters for clothing companies. Fashion illustration from the 1900s is more rigid than today’s informality; also, the proportions of the models and rendering of the clothes is realistic. It was Charles Dana Gibson’s (1867–1944)Gibson Girl that became the symbol of a ‘new woman’ complete with standards of beauty and manners in addition to fashion. Currently, Fashion illustration seeks emotional connections. It is more fluid and more abstract. Body proportions lengthen by drawing the limbs and legs longer than normal to express an elegance, yet mostly unreal, slenderness. Fashion illustration evolves over the decades to match the spirit of the times. Today’s fashion illustrator captures the essence of designs more than making realistic portraits. Research an historical fashion illustrator and a contemporary fashion illustrator and emulate their different styles while you think about how you will communicate ideas. Now that you can proportion a figure, shade and shadow three dimensional form, it is your turn as a fashion illustrator. What will you draw? Think about what inspires and excites you. Is it fancy or is it comfortable like a favorite tennis shoe. Is it skin tight? Is it baggy? Is it minimal or excessive in its use of fabric? Does it have understated detailing or oversize buttons, loud and large stitching or ribbons? Does it have a collar? Does it include a hat and scarf or jewelry? Asking different questions such as these and understanding how the clothes fit is important in designing what you want to draw. Will you capture the model and clothes accurately and realistically? Or do you want to abstract a particular part of the clothing to capture the most important part of it, such as how big the skirt is, how long the train is, or how puffy the shoulder pads are? Do you want to convey an attitude or spirit with your figures and your collection? Look at Rene Gruau’s illustrations for the Miss Dior perfume ads, and see how his style of rendering indicates different kinds of clothes with different aspirations. Now, it’s your turn! 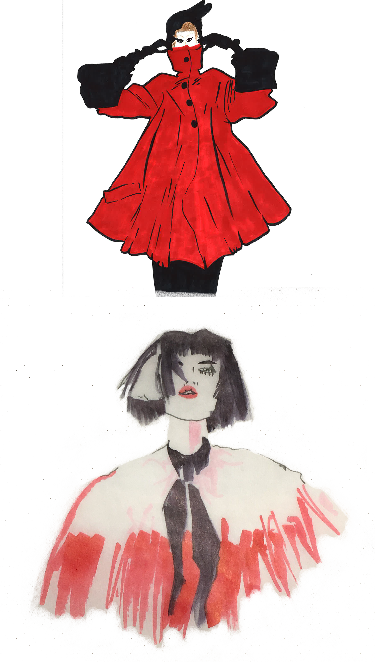 Using your favorite fashion illustration and medium, make four fashion illustrations showing various types of clothing. 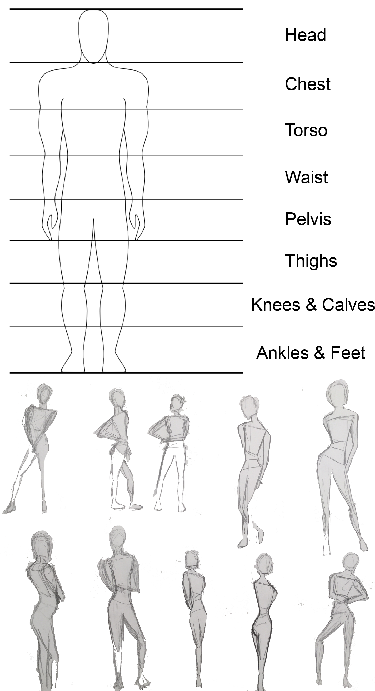 There is no such thing as a locked proportion guide for drawing the human figure. 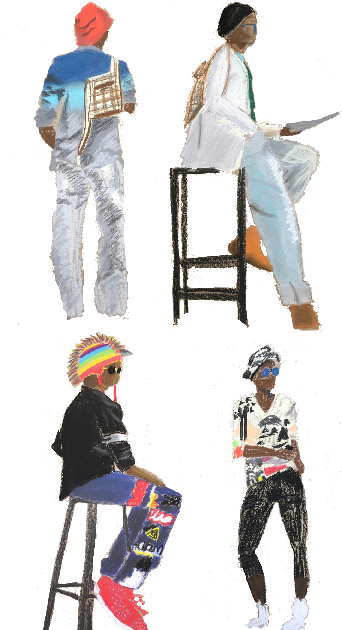 Fashion Illustration has to be accurate and cannot be abstracted when it comes to drawing the clothes, but the model can be as abstracted as desired.